As I expected the news about the Lunar Eclipse happening on the 31st of January 2018 was in the media and social media all around the world… even though in many countries (Europe, South America) the Lunar Eclipse was not visible. In my humble opinion, many of the articles in general outlets and media were not very well written and actually very hype, which created that people were actually confused about what was happening. Of course, I complained a lot about how the news were presented in the media. 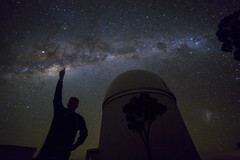 I’m a huge defender of inviting people to look at the sky (I’m continuously doing it!) but not exaggerating what people should expect to see. In this sense I’m an “old-schooler” as I really consider facts and naming things properly are important. After having some discussions with friends in social media about all of this, I decided to create a poll in Twitter to explore this more (thanks @DarkSapiens and @vrruiz). Furthermore, following the “noise” in Twitter, I had the feeling that young people care less about the actual name of the phenomenon than older people. That is, young people didn’t dislike naming the event as a Super Blue Blood Moon. And that was the beginning. As a scientist I wanted to test if my hypothesis was right. Hypothesis: At least in Twitter, as I see in my timeline, young astronomers/science communicators seem to prefer or at least are less molest with the term #SuperBlueBloodMoon than old astronomers/science communicators. 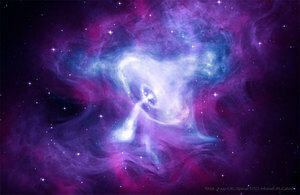 Experiment in Tweet: I’m testing an hypothesis. Could you please choose your age range (=older or younger than 33) and if you like/dislike #SuperBlueBloodMoon or prefer #Itisjustalunareclipse ? I’ll use this to write a post about using hype in astro news. Thanks and please share. Below is the screenshot with the question and the results. Huge thanks to the 580 people who contributed in this poll (11% of my followers). The conclusions that we can get from these results, that as I’ve said apply for my vision in Twitter, which is biased for the people who I follow or follow me, are the following. First, the majority of my followers/people who answered this question are older than 32 years (60%). Fair enough. Second, combined, only 19% of the answers agree with “I like SBBM”. I’m happy about this. And this was actually expected, because there should be a huge bias in the people that follow me in Twitter. But the interesting thing for me is that, attending to these results, younger people like SBBM more than older people. The ratio between YES/NO is 25% for <33 years and only 15% for >=33 years. 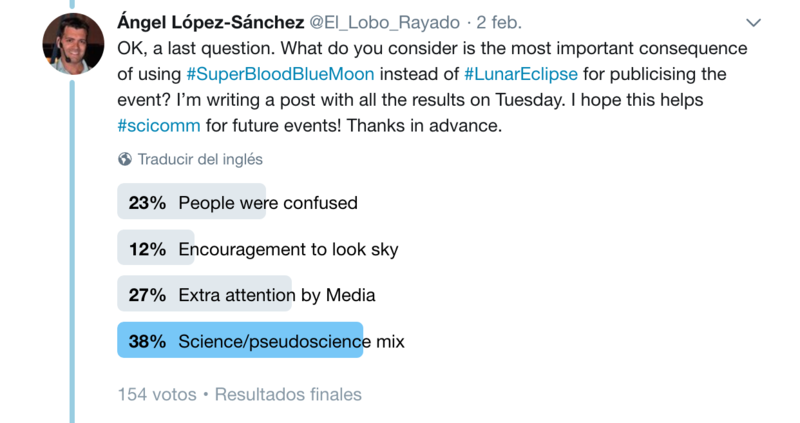 Without any additional statistical analysis including uncertainties, this result seems to support my hypothesis and the reason of this experiment: young astronomers/science communicators seem to prefer or at least are less molest with the term #SuperBlueBloodMoon than old astronomers/science communicators. But I also asked two extra questions. The results here are also interesting. 3 people in 5 agree that using SBBM is hype (yes!). I was expecting this answer would have been around 2/3, but it is still a good proportion. 27% of the answers (a bit more than 1 in 4 people) support using SBBM in the title of the news as long as the facts are explained in the text (which was rarely the case). 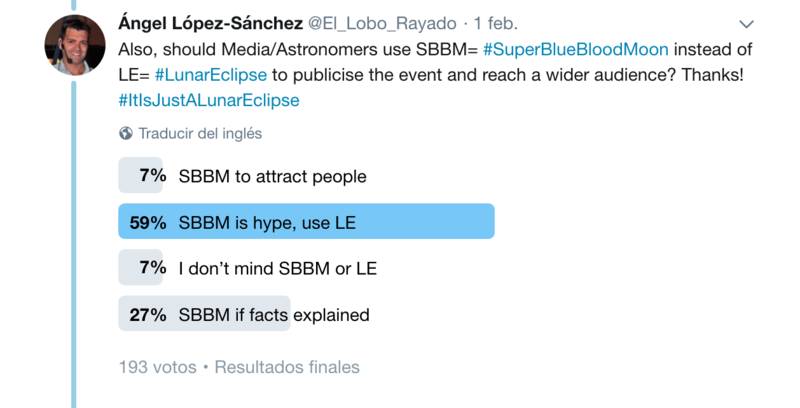 My conclusion here: although some people think than using SBBM is a good thing to attract people to the news or observing the sky (but see next question), the majority of the people consider that SBBM is hype and should not be used, unless the facts are well explained in the text of the news. Question 2: What do you consider is the most important consequence of using #SuperBloodBlueMoon instead of #LunarEclipse for publicising the event? Well, here 61% of the answers agree that “it is not that good to do that” as science/pseudoscience mix and people were confused. And indeed people were confused! During the last week I’ve been giving some virtual talks in Spain with students, and I received the question “what was the SBBM?”. 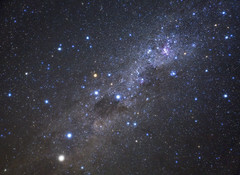 They didn’t know it was a lunar eclipse, and they show some connections with astrology (!!!). Still, 27% (more than 1 in 4) of the answers agree on using SBBM for getting the extra attention by Media (I assume that considering facts are explained, something that didn’t happen very often). 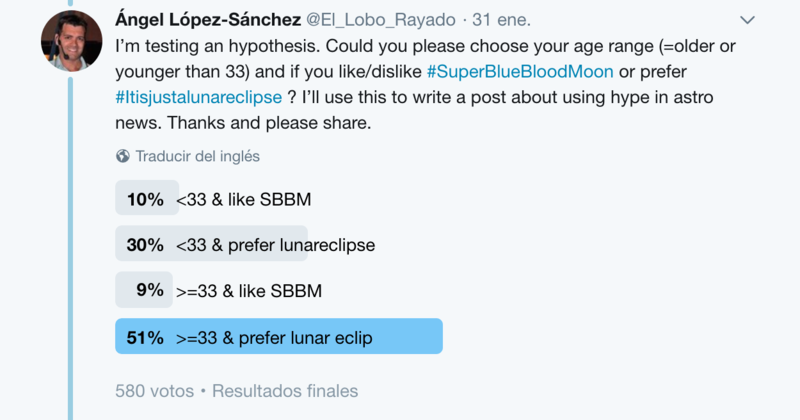 Only 12% of the answers agree that using SBBM instead of Lunar Eclipse encourage people to look the sky. 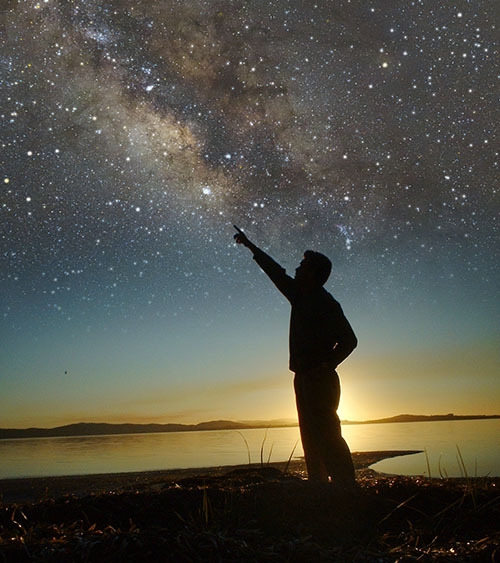 My conclusion to this question: although it might help to encourage people to look at the sky and for sure will attract the attention of the media, we should refrain to use SBBM as it confuses people at the same time that mixes science and pseudoscience. 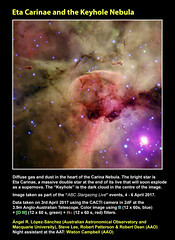 This entry was posted in Outreach and tagged 2018, moon, Outreach, SciComm. Bookmark the permalink. So 12% of your respondents believe astronomers should lure people to watch an event in the sky, using hyped up astrology-inspired nonsense, only for them to subsequently feel totally let down and lacking any understanding of what they saw? That’s not public outreach, it’s deception. It’s not science, it’s pseudoscience – and it’s counter-productive! Interesting stats, but I think there is bias in your followers 😉 I think a more representative population is that other massive poll called #SuperBlueBloodMoon in Twitter, which was worldwide trending topic. I just took a quick look and I see many pictures and few complains. So, at least, it got people interested in the eclipse. PS: This seems a referee report!